How do I add a publication date to a submission? 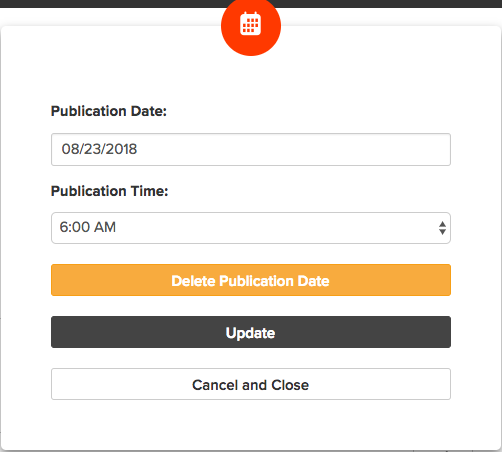 Organizations can optionally add a Publication Date to each submission and view a calendar of submissions ordered and grouped by Publication Date. Choose to Accept the submission by checking the box next to the submission in the Submissions List and then clicking the green check mark button at the top of the list. You can also accept the submission within the Submission Details page by clicking the status button in the upper right-hand side of the page (the button should say New or In-Progress). You then select Accept. 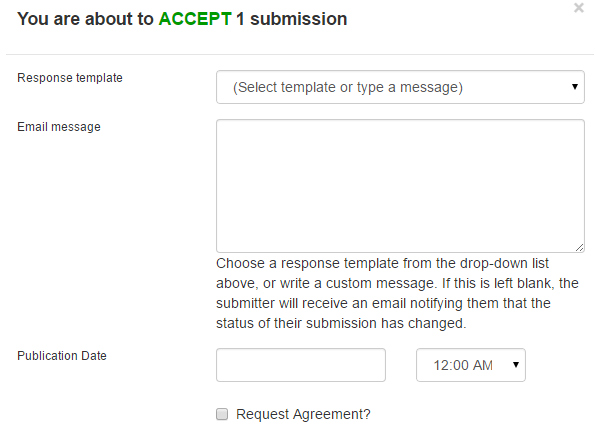 A dialog box will open that states You are about to ACCEPT 1 submission (see below). Enter the Publication Date in the appropriate box. 3. To edit or delete the Publication Date, go to the Submission Details page of the submission you want to edit. 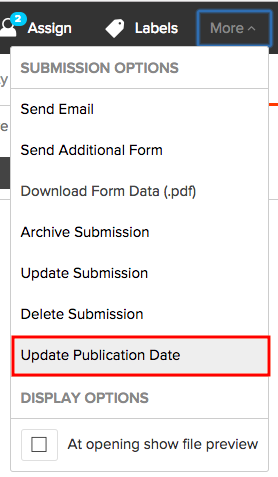 Click the More drop down menu in the upper right and select Update Publication Date to delete, add or edit the publication date. For more information on the Calendar feature, please read this help article.